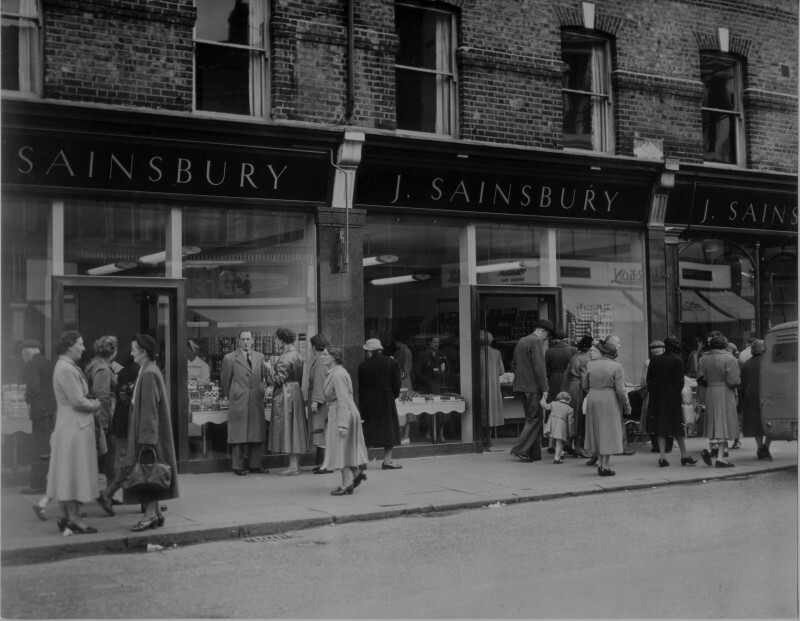 From the 1890s onwards, Sainsbury's new shops shared a common 'house style' with long shape, tiled walls and marble-topped counters. Sainsbury’s counter service shops all followed a similar layout. Central positions in shopping parades, were preferred to corner sites. The shops were long and thin with a small frontage. This made it easier to keep goods cool and provided maximum counter space for serving customers and displaying goods. Typically these shops only had a sales area of around 2,200 square feet. Sometimes, to increase sales space, the shops extended through the window and on to the market street. Counters ran along the walls of the shop, and sales assistants were positioned down them, at each department. By the 1930s, most stores had six departments: dairy, bacon and hams, poultry and game, cooked meats, fresh meat and groceries. The ‘Top spot’ near the window was reserved for displaying seasonal specialities or for the butterman. A polished wooden screen divided at the back divided the shop floor from the office and other rooms behind. Customers queued at each individual department to select their goods, which would be prepared and wrapped for them. In some shops the customer would pay at each department; in later years, the cashier’s office was located at the back of the shop. Goods were displayed both on and behind the counters: bacon and hams were hung from rails. Groceries were stacked on tall, polished wooden scales. Hams were displayed on pink and white ceramic stands which matched the decorative scales, designed by Herbert & Son. Window dressing was an important part of working at a Sainsbury’s counter service shop. Photographs and drawings of displays were distributed by head office to be copied. Instructions were also issued on the length of time that perishable goods could be kept on display. Boxes of butter and margarine could not be shown in window for more than half a day. Instructions stated that window displays must be completed ‘by 10 o’clock each morning, including Mondays’. The district supervisor visited regularly and would order the re-dressing of any window which was not up to standard. Elaborate displays would be produced for product promotions and special occasions: at Christmas, rows of poultry would be hung outside the shop. 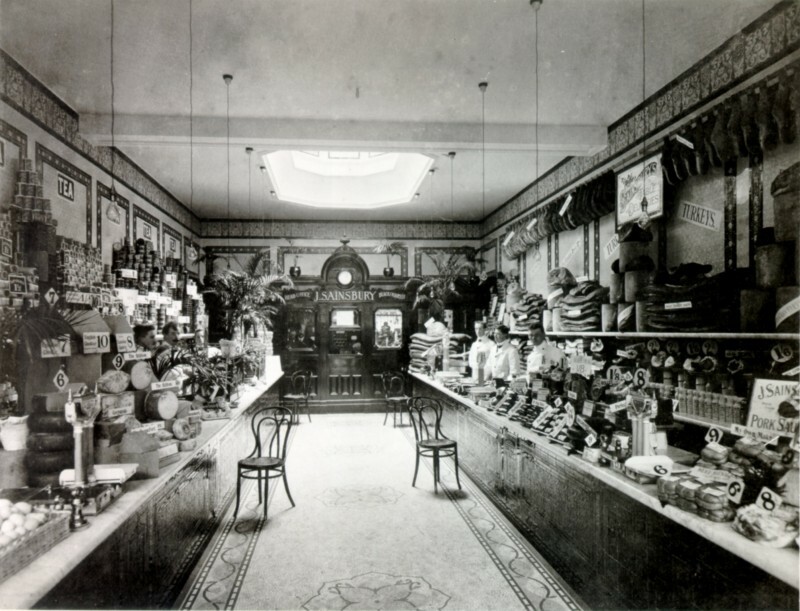 The tiled walls and marble counters of Sainsbury’s Croydon branch, which opened in 1882, became the model for the company’s ‘house-style’. Produced by Minton Hollins, the tiles were highly glazed and the patterns were complicated. John James Sainsbury was criticised for his expensive choice of shop fittings, but the tiles kept the shop cool and were easy to clean. Shop lighting was another important feature. There were gas lights both inside and outside to show off the merchandise. From 1905, new branches were installed with electric lighting and most had converted to electricity by 1914. John James Sainsbury’s final words are said to have been ‘keep the shops well lit’. During the interwar period Sainsbury’s expanded rapidly and shops were fitted out to a standard design. However there was some local variation. The wooden screen in the St Albans shop which opened in 1924, featured classical columns and pediments inspired by the nearby town hall. 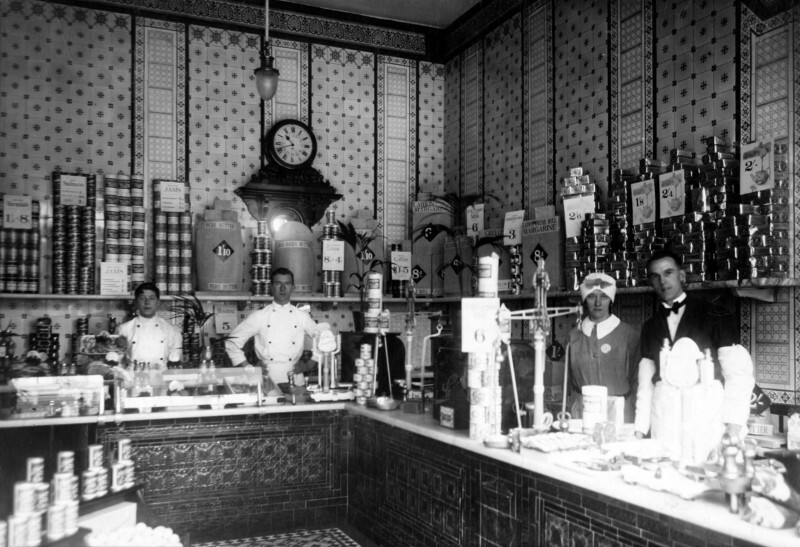 The overall look of shop interiors remained the same between the 1890s and 1930s, but small improvements were made. Plaster moulding decorations were added and a low glass screen around the counters to protect the food. Everything was cleaned scrupulously. The marbles counters, tiled walls and counter fronts were scrubbed each day and the tiles polished with ball whitening. Once a week the bacon rails were taken down and burnished with sandpaper. Even grocery displays were dismantled and rebuilt each week, using strips of paper to ‘tie’ the stacks together. A central motif of stylized crown imperials in cream relief. Surrounding this was a rectangular pattern of chrysanthemums on a white, blue and brown background. There was a border just below the ceiling, of celadon green tiles, illustrating stylised dolphins and fleurs-de-lis. From the dado to the floor were pattern relief tiles in yellow, brown and white. 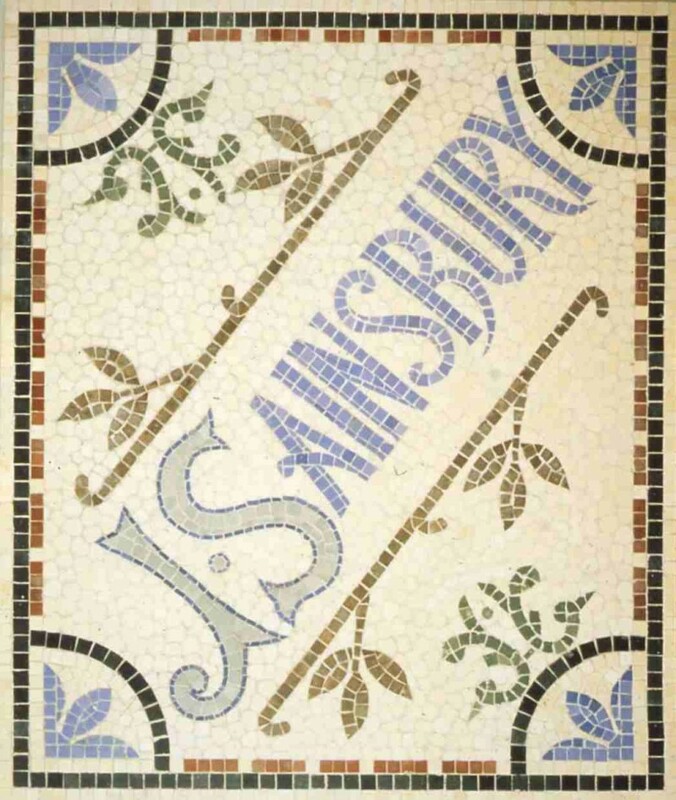 On the counter fronts were glazed tiles in what Minton’s called ‘Sainsbury’s teapot brown’. The counter tops and shelves were made of white Sicilian marble. The floor covered in a ceramic mosaic in shades of grey, blue, green, white and brown. The tiles were made by Italian craftsmen employed by Minton’s. The external appearance of Sainsbury’s shops was vital to the business, particularly as Sainsbury’s expanded into areas where the company name was not well-known. Counter service shop frontages tended to follow a standard design. They were made from Norwegian and Swedish granite, with tall sash windows and polished teak frames. Above the shop front was the striking wrought iron structure that held the gold leaf lettering of ‘J. SAINSBURY’, which was visible the traffic from the other end of the street. Sainsbury’s shopfronts remained much the same until the 1950, when a radical new style was adopted. At Sainsbury’s first modernised store at Selsdon, near Croydon, the old open windows were replaced by single sheets of armoured plate glass and central shutters with permanent doors. The new external fascia featured Sainsbury’s name in gold on a background of ‘blue pearl’ granite with a red granite surround. The glass frontage gave customers and uninterrupted view of shop’s interior, including the self-service checkouts. Sainsbury’s first in-house designer Leonard Beaumont established a corporate image for self-service stores which was consistent from shop fascias (which used the Trajan typeface) to in-store signage. By the 1960s, new supermarkets featured illuminated signs, with the orange Sainsbury logo on brick or granite. New pedestrian precincts provided opportunities for public art commissions. The Chelsea store which opened in 1966 featured a sculpture by John Wragg; concrete murals depicting an area’s history were also a popular feature of 1960s and 70 supermarkets. 16-20 Holloway road store, 1950s. Self-service stores looked very different to the counter service shops. Wall and counters were still tiled, but designs were simpler and the old green, cream and teapot brown tiles were replaced with lighter shades. Goods were displayed on free-standing shelving units rather than in windows or on counters. These shelving units or ‘gondolas’ incorporated a display area at each end. Cheaper goods tended to be displayed on the left of shelves, moving to the right as the prices increased. How much of each product was displayed depended entirely on its sales. By the 1970s, gondolas had grown much taller to accommodate more products and overhead signage was introduced. Display cages became popular with many retailers, as they could be delivered ready-filled by suppliers. They were briefly used by Sainsbury’s in the mid 1970s, but were felt to be untidy-looking, as well as incompatible with centralised distribution. During the 1960s and 70s, many new larger stores opened. Increased floor space made the shop layout even more important. Layouts were standardised, so that customers could find what they wanted. Larger edge-of-town stores provided space for ample car parking, customer restaurants and other retail concessions. New service counters were also re-introduced alongside self-service. 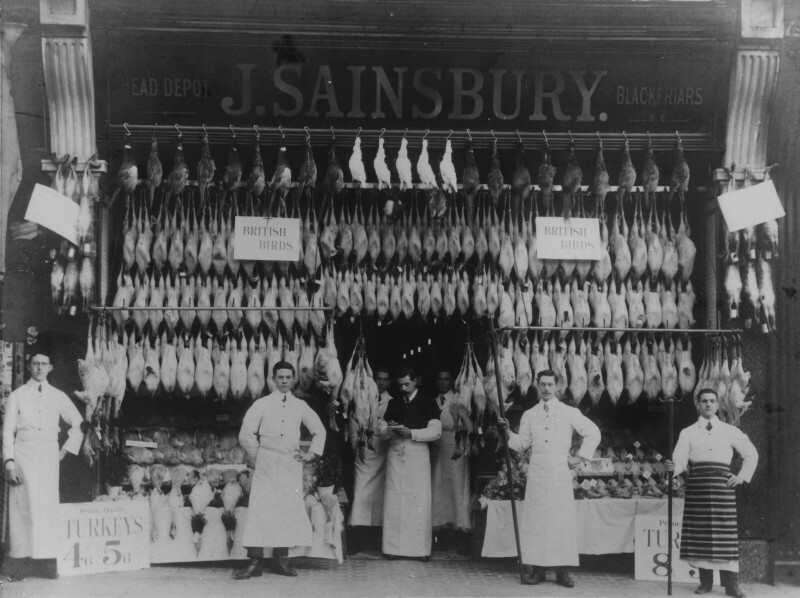 Sainsbury’s first supermarket delicatessen counter opened in Wandsworth in 1971 and stocked 73 items. 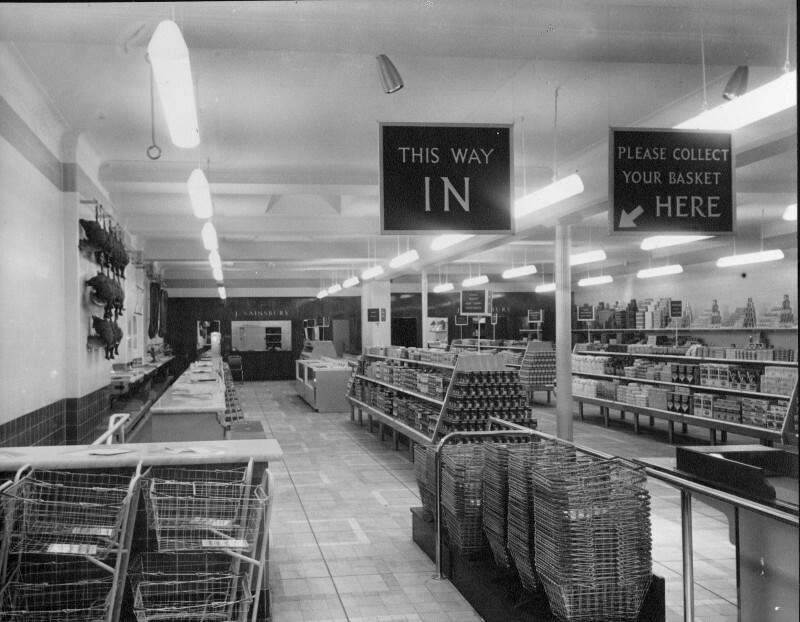 The first in store bakery followed at the Telford store in 1973. ‘Freeflow’ produce, which allowed customers to select and weight their own items, was introduced from 1976 and proved extremely popular. As stores grew larger displays became more imaginative. When the Bretton branch opened in 1972, its wine department was arranged as self-contained ‘shop within a shop’. During the 1980s, supermarket architecture became more adventurous. The Canterbury store which opened in 1984, was designed by Ahrend Burton and Koralek and was the winning entry in a competition organised by Sainsbury’s. In 1988 Camden Council (1988) was keen to have a ‘high-tec’ building for a former bakery site. Sainsbury’s store there was designed by Nicholas Grimshaw. It used webbed steel to support a huge arced roof, creating a clear sales area of 30,000 square feet. Designs like this provoked mixed responses. In 1986 the average size of a store’s sales area was 28,700 square feet (sq ft). The size of convenience stores is at around 3,000 sq ft through to superstores at 70,000 sq ft, but most stores are ‘traditional supermarkets’ between 25,000 and 45,000 sq ft. The company’s strict design specifications meant it rarely traded in buildings designed by other retailers. Where it did, they were completely refitted before re-opening. From the 1990s it has been Sainsbury’s policy to respond to the local environment where possible in its store design. Traditional building materials are used - reclaimed local stone in Macclesfield and Rhyl and flint cladding in Thetford. The Plymouth branch features sail-shaped roof details reflecting the city’s seafaring history. Many new town centre developments include a mix of residential, office, leisure and community facilities as well as supermarkets. In a £90 million joint venture with the council, part of Maidenhead town centre has been redeveloped, including a new piazza. Larger stores are sometimes part of major regeneration schemes such as the award-winning transformation of Birmingham’s Castle Vale ‘sink’ estate. The development of brownfield sites has also led to the incorporation of historic buildings into Sainsbury’s designs. Environmental improvements are also a feature of today’s supermarket developments. In 1999 Sainsbury’s was selected by English Partnerships to pioneer the UK’s first ‘low energy supermarket’ at the millennium site in Greenwich. The futuristic design features natural daylight, solar panels and wind turbines.